Omen or opportunity? Talking to children about death and loss. Niki Read has been involved in creative and community development approaches to end of life for many years. She has been a collaborator of The GroundSwell Projects’ since the beginning and is currently developing two local compassionate communities initiatives. This story shows us how death literacy can occur in the most unexpected places. It was our first night on the road on a long trip to the red centre, and we’d made it all the way to Nyngen. I was feeling pretty chuffed, the riverside camp ground was lush but I was still green, not yet road-trip set-up savvy and I knew the temps were dropping fast. My four-year old was off exploring as I unloaded the car when we both heard a squawk and a thud. Looking over I saw that a galah had fallen out of the slender gum not far off. To be honest, it barely registered and I kept on setting up. I was more anxious than I realised to get set up and in the tent ready for stories and bed before the below zero mid-winter darkness consumed us. At that call, I went to have a look and I could see that the poor wee bird had cracked its neck and had no chance of survival. “It’s dying love” I say, pathos in my voice and distractedly walk back to open a tin of soup. But superstition had kicked in and somewhere inside me I thought “this is not a good sign”. Death on the door-step the first night on the road! The young fella comes over to where I have the entire contents of the car spread out on the grass and tells me we need to help the bird. He tells me “it’s not dead Mum, it’s alive and it’s not going to die, we can help it, we can fix it, it’s so cute Mum can we touch it, can we take it with us, it’s not going to die Mum is it? Is it Mum? Is it? !” It’s then that I truly hear him talking. I feel my anxiety rising. I just want to get the tent up and ignore that feeling. But he keeps talking me round and softening me, I step through the murky waters of fear and realise that there is an opportunity here to be with my son as he learns about caring for the dying. There’s a farm girl inside me that knows about such things, and a young woman who has experienced the beauty and the mess of the death of several loved ones. There’s some knowing about such things within me. We go over to it together then, gather it up tenderly, four year old chooses his favourite tea towel as a blanket (it has cars on it!) and we put the wrapped bird into an emptied box. We sit for a long while with it, talking together about the processes of dying and four year old grapples with the reality that there is nothing we can do for the dying bird but make it as comfy as possible. We observe the breathing patterns changing and watch as it eyes open and close. We choose some toy animal friends to place around it so that it’s not lonely, and we put our arnica ointment in with it to ‘ease the pain’. Then we sit. We sit and talk to it, we pat it gently, we give it a name, a history, a story. We talk about life, and death. When ‘Blossom’ dies and I return to setting up camp I no longer feel anxious about our first night, the bad omen or the road-trip. I feel rather, like a parent, having shared with my dear son one of the natural processes of life, sad and true. It is quiet then and still, the river flowed on beside us. 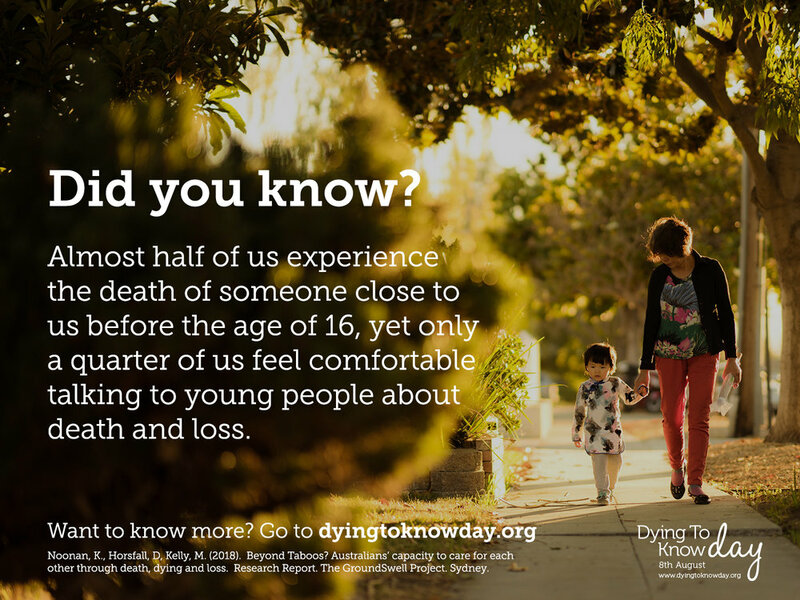 This blog is part of the ‘Did You Know?’ blog series where D2KDay is bringing to life conversations and information around death, dying and bereavement. Newer PostNotes from the Undertaker – Remember the funeral director works for you! Older PostLeave to Grieve. How can you take action for D2KDay?